August 4, 2017 – Mister Journalism: "Reading, Sharing, Discussing, Learning"
It is not always pretty when the public gets a chance to voice its opinion, but it is democratic. In the last week, I attended the Sweetwater Union High School District (SUHSD) and the San Diego Unified School District (SDUSD) school board meetings. It was reminiscent of Dicken’s depiction of Paris and London. Sweetwater which has been living a nightmare for most of the previous decade was like being at camp sitting around a bonfire singing “John Jacob Jinglehimer Smith.” It wasn’t quite Kumbaya but it was close. SDUSD was the opposite. Parents, teachers and various community leaders came to engage in public debate. It was a war of words and philosophy. It was far from a Kumbaya moment. People made their case in a public forum and with one dreadful exception they did so in a respectful manner. Matt Barnum this week reported on an extraordinary private meeting of many of the Big Guns of reformsterdom.It happened back in March; only just now are people talking about it. Arne Duncan, John King, TFA, DFER, Uncommon Schools, Achievement First, KIPP– the twenty-five gathered folks included all these and more. Barnum reported that Shavar Jeffries (DFER) organized “in part” the meet, which says a bit about his ability to gather folks. DFER apparently still has juice. Which is an odd choice. Blood money is money you get because someone has died, and the funding system for charters beloved by Arne Duncan absolutely depended on getting money by taking it from public schools, even if it killed them. Duncan’s USED was, if anything, more pro-charter than DeVos, who much prefers vouchers. And when it comes to public education, the major difference between Duncan and DeVos was that Duncan at least pretended to say the right thing, while DeVos wears her disdain on her sleeve. 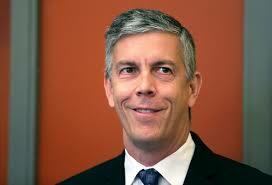 But Duncan is not suggesting the moratorium because of any loyalty to public education. In fact, now that I think of it, maybe the somebody who has died, the murdered party that Duncan wants to avenge, is the federal education bureaucracy. Not, says Barnum, that any charters are considering Duncan’s idea [Update: at least two of the chains did not take a position at all]. So it’s Arne doing what he has often done– telling other people how they should conduct their business, even though he has no skin in their game. But what was really intriguing about the account of the meeting was its purpose. The overarching question at the March discussion, organized in part by Jeffries, was how education reformers should respond to the Trump and DeVos administration, including on issues beyond education. The left-of-center charter school advocates who held sway in the Obama administration have a complicated relationship with DeVos, who backs charter schools but also private-school vouchers and, as a member of the Trump administration, is viewed skeptically by many. In other words, they were wrestling with the problem that some reformsters have struggled with since it Trump won the election– how to distance themselves from people who are politically linked to the wrong party and the wrong end of the left-right continuum, but whose policies are completely in alignment. As long as these nominal Democrats were led by nominal Democrats in a nominally Democratic administration, they could go ahead and pursue fundamentally conservative education policies. But now DC is occupied by something kind of like conservative Republicans– and when it comes to education they want all the same things. This meeting circled around the distinction we seem to be going with “progressive Democrat” reformsters are doing it for the social justice, but “conservative GOP” reformsters are doing it because they love the free market. I suppose on some level the distinction matters, but the actions they want to pursue– eroding public education and the teaching profession in order to privatize the entire system– are identical, and ultimately, if you and another person insist on punching me in the face, I’m not sure I care a whole lot about the difference in your rationales. Particularly when, as I believe is the case in ed reform, behind both punchers is another guy who doesn’t care about either rationale– he’s just bet on the fight and he wants to make a buck. As Diane Ravitch has pointed out, DeVos rode to Washington on a thoroughfare leveled and paved by Democrats. For them to have their little private meetings where they clutch pearls about DeVosian awfulness is either monumental cynicism or stunning delusion. Either way, Duncan better take a look at all those checks he’s cashing as a sought-after consultant based on his time in DC dismantling public education, and he’d think a little harder before he starts bemoaning blood money again. For the past five years — with the exception of a dip in 2016 — spending on lobbying in the first six months has been steadily increasing. Overall spending for the first six months of 2017 amounts to $1.66 billion — the highest it has been since the first half of 2012, which was followed by a roughly $50 million drop in 2013. However, while money has been pouring in, the number of lobbyists has been dwindling….read more. What does the 2018 election hold for House leadership? The Center will soon be updating web pages for members to include 2018 cycle data. As a preview of what’s coming, here are some preliminary numbers for House leaders Paul Ryan and Nancy Pelosi. Source: What does the 2018 election hold for House leadership? URGENT – ICE Agents engaged in Fugitive Operations in Grand Rapids right now! Since at least last Sunday, Immigration & Customs Enforcement (ICE) officers have been engaged in what they refer to as Fugitive Operations. Fugitive Operations is when ICE agents have a list of people they want to target who are undocumented, often with minor offenses like driving without a license. These Fugitive Operations create a climate of terror in the immigrant community, which always experiences tremendous amount of fear. Some people don’t want to leave their homes for fear of being picked up by ICE agents. Parents fear that ICE agents will take them, leaving their children to come home and not knowing where there parents are. I work with the Rapid Response to ICE team in Grand Rapids. We have been made aware of at least 6 cases of ICE agents taking people throughout the greater Grand Rapids area.